The Connie outside of the Toronto airport. 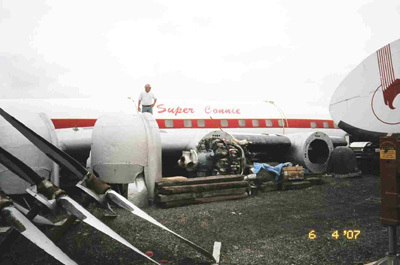 (Editor’s note: Part two of a continuing series about the Lockheed 1049G Super Constellation that arrived at Griffiss Business Park on June 8,2007 and is being refurbished at the Empire Aero Center. Empire Aero Center chief mechanic Kevin Lacey feels a certain kinship with “Connie,” the Super Constellation airplane that has been entrusted to his care. He’s not alone. You never know when or where a Connie fan might turn up. A little research on the Internet revealed that there is a “Save The Connie” group of Constellation fans based in Kansas City, MO. The model 1049G that is being rebuilt at the Griffiss Business and Technology Park is believed to be the last of its kind. 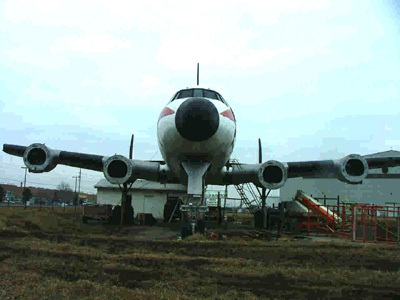 EAC is under contract to restore the plane and will eventually send it to the Museum of Flight in Seattle for display. A few weeks ago, Lacey was telling a visitor about the history of the 53-year-old plane and showing off its interior, which has been wrapped in protective plastic. As he climbed down from the plane and returned to the tarmac, he was greeted by a young man wearing an “In Flight Canada” logo on his shirt. Brian Kucherepa was at the Empire Aero Center on business, but he said he couldn’t believe his eyes when he saw the Connie. “I used to eat there a lot,” he told Lacey. Several times in its colorful past, the airplane was used as a conference facility, cocktail lounge, deli and restaurant, and its bar is still in place. From 1998 to 2002, the plane sat at the north end of Pearson International Airport in Toronto and was used as a bar and restaurant. However, the business failed because the plane was so far removed from the terminal. It was parked in an industrial section amid cargo hangars, said Kucherepa, and the owners never advertised it. They actually lost money on the venture, so the plane was not maintained and even abandoned for a spell. A website (www.geocities.com/constellation1049g) even said the Super Connie was advertised for sale on e-Bay. The starting bid was $200,000, but the final selling price was not disclosed. For more details on the sale of the airplane, Click here. Eventually, the plane passed into the hands of Catherine Scott of Toronto (reportedly in lieu of an outstanding bill owed to her). She sold it earlier this year to the Museum of Flight. 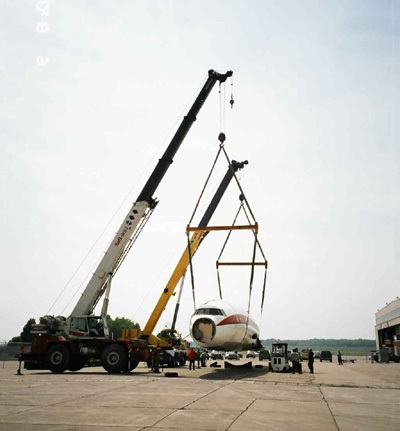 The Super Constellation was dismantled when it left Toronto for the trip to Griffiss. However, its cockpit panel remains intact. Kucherepa said, "It looks like a lumberjack took it apart." Larry Dwyer, who runs a website on aviation history, The Aviation History Online Museum is a Connie fan and a former TWA airline mechanic who regrets that he never personally got to work on one of these planes. However, he drew on the recollections of some veteran mechanics when he wrote his history of Connie. Generals Dwight Eisenhower and Douglas MacArthur used “Connies” for their personal use and Eisenhower chose the Constellation for his presidential plane. The Army Air Force purchased 22 Constellations during World War II as model C-69 transports. The "stretch" was accomplished by splicing an extra 9-foot-2 inch section into the body just in front, and another just aft of the wing. The 1049 also had more powerful turbo compound R-3350 engines and carried 6,550 gallons of fuel with an optional wing center tank capable of carrying an additional 730 gallons. Lockheed built a total of 856 Constellations (331 for the military). The Connie’s piston-fired engines suffered a number of early accidents and Lockheed was forced to alter its design. As the first post-war plane capable of transcontinental service and having an air pressurized cabin, however, it proved to be a popular commercial airliner. The Connie was eventually replaced by the jet engine, in particular the Boeing 707. The Air Force Museum in Dayton, OH, has two preserved Connies, including the Presidential Constellation. The “Save a Connie” group was said to have one of the only operating Constellations and one of the only L-1049G Super Constellations left. April l7, 1944: Howard Hughes (pilot) and TWA president Jack Frye flew the L-049 from Burbank, CA. to Washington DC, in 6 hours and 57 minutes. On the return trip, the aircraft stopped at Wright Field to give Orville Wright his last plane flight, more than 40 years after his historic first flight. He commented that the wingspan on the Constellation was longer than the distance of his first flight. Pat Malin is a freelance writer/photographer based in Central New York. For further information, contact scotchbutter7@yahoo.com.